Pothys Latest Dresses Online: Handloom sarees – A Class Apart! Looking for a unique gift for your better half or your sister? Or would you like to gift your mother but are in a dilemma about the perfect present? Take a break, as the handloom saree from Pothys would lay rest to your entire predicament. It is a perfectly sought out gift that can never go wrong and simply brings the essence of the land we live into the picture. Handloom sarees have a down to earth feeling. 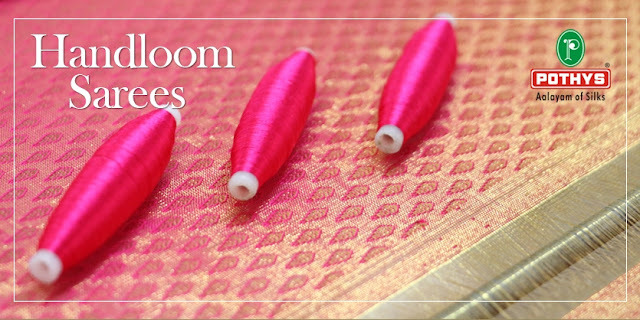 The reason could be that they are made by hand and showcases the true talent of Indian craftsmen. The homegrown artisans bring together some memorable design patterns and embroidery and we at Pothys have embarked upon ourselves to give you only the best our tradition has to offer. Every state in India has a uniqueness to its region and this unique touch makes a handloom saree of each state vastly different from the others. Women know the worth of such sarees and while these sarees can be worn casually, they can also make a style statement on its own. Whether you are a homemaker or a professional or even a bride, choose from the elegant ensemble of handloom sarees exclusive at Pothys online. Grace them casually or match them with a light accessory. They are extremely easy to look and do not appear heavy. Elegance is the other word for such tradition attires from the heart and soul of India and over time they have reinvented themselves and have garnered a special respect among the global audience. Hop on to the Pothys online store to choose from a wide range of handloom sarees and Patola sarees to get the feel of authentic India. Saree is one of the parts of women's life!